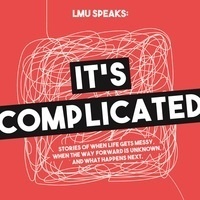 The William H. Hannon Library's third annual LMU Speaks program will feature true stories from 4 individuals representing the LMU campus community. We have asked each of our speakers to share a true, personal story based on a central theme, "It's Complicated”. Speakers will tell a 10-minute story that responds the prompt, "Tell us about a moment from your life when things got messy and muddled, when the pathway forward seemed enigmatic and entangled, or when you found yourself bewildered and befuddled. And then tell us what happened next."